You work full-time and recently invested all of your free time in earning a security certification (or three) because you believe in creating your own opportunities. Your company paid for boot camps, online labs, books, and certification vouchers for you to get those credentials. You get a fake smile and blank stare. Then the awkward silence ensues. Your boss tries to explain that credentials do not equate to automatic raises. You did not hear the rest of the feedback because the way your ADHD is set up…you tuned him/her out after the first few words and started calling the manager everything but the child of God in your head. Then self-doubt creeps in, and you wonder why you missed the new season of Mr. Robot for studying only to find out that the certs do not come with a fully funded trip to Bora Bora. How much would a Lyft ride home cost if you take an extended happy hour to over-analyze what you could have said or done differently to get your raise? Wait, can I play devil’s advocate for a minute? The department budget was impacted by spending hundreds or thousands of dollars on your credentials. You have not shown any results other than you passed the tests. What is the company’s return on investment (ROI) to justify an immediate pay increase for your skills validation? 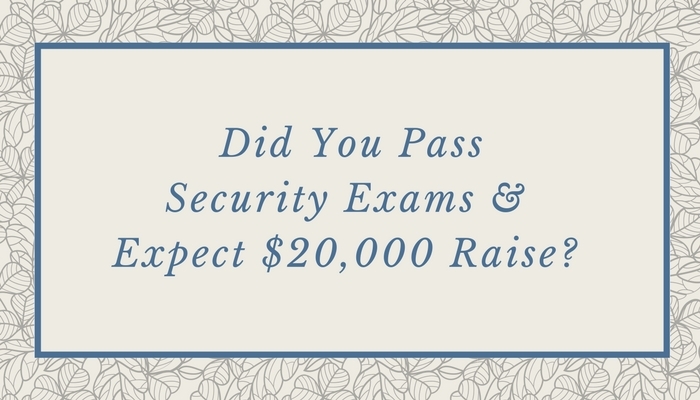 Let me know why you deserve a raise for passing your tests. Then in Part II of this article, I will provide tips on how to create and demonstrate ROI leading up to the money conversation. Also note that this post sparked lively debate on social media and in my inbox, so I’ll also include the most relevant feedback from industry peers. ← Support Other Women + Save The Date!